Only showing posts tagged with "SQL CE"
In my last post, I explained some workarounds that you could hack into your LINQ queries to get them to perform well when using LINQ to SQL and SQL CE 3.5. Although those workarounds do help fix performance issues, they can make your LINQ query code very verbose and noisy. In places where you’d simply call a constructor and pass an entity object in, you now have to use an object initialiser and copy the properties manually. What if there are 10 properties (or more!) on that class? You get a lot of inline code. What if you use it across 10 queries and you later want to add a property to that class? You have to find and change it in 10 places. Did somebody mention code smell? In order to work around this issue, I’ve whipped up a small amount of code that allows you to centralise these repeated chunks of query code, but unlike the normal (and still recommended, if you don’t have these performance issues) technique of putting the code in a method/constructor, this doesn’t trigger these performance issues. How? Instead of the query calling into an external method to execute your query snippet, my code takes your query snippet and inlines it directly into the LINQ query’s expression tree. (If you’re rusty on expression trees, try reading this post, which deals with some basic expression trees stuff.) I’ve called this code the ExpressionTreeRewriter. Normally, you’d just put those property assignments in a PersonDto constructor that takes a PersonEntity and then call that constructor in the query. Unfortunately, we can’t do that for performance reasons. So how can we centralise those property assignments, but keep our object initialiser? I’m glad you asked! Okay, admittedly it’s still not as nice as just calling a constructor, but unfortunately our hands are tied in that respect. However, you’ll notice that we’ve centralised that object initialiser snippet into the ToPersonDtoExpression property and somehow we’re using that by calling ToPersonDto in our query. 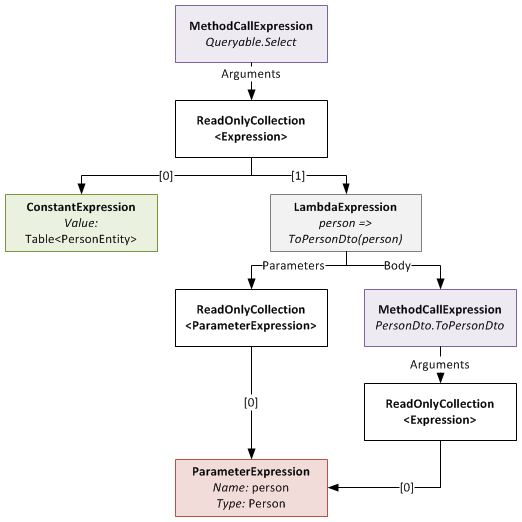 Notice that the LambdaExpression’s Body (which used to be the MethodCallExpression of the marker method) has been replaced with the expression tree for the object initialiser. Something to note: the method signature of marker method and that of the delegate type passed to Expression<T> on your static property must be identical. So if your marker method takes two ClassAs and returns a ClassB, your static property must be of type Expression<Func<ClassA,ClassA,ClassB>> (or some delegate equivalent to the Func<T1,T2,TResult> delegate). If they don’t match, you will get an exception at runtime. The ExpressionTreeRewriter is the class that implements the .Rewrite() extension method. It searches through the expression tree for called methods that have a RewriterMarkerMethodAttribute on them. RewriterMarkerMethodAttribute is an abstract class, one implementation of which you have already seen. 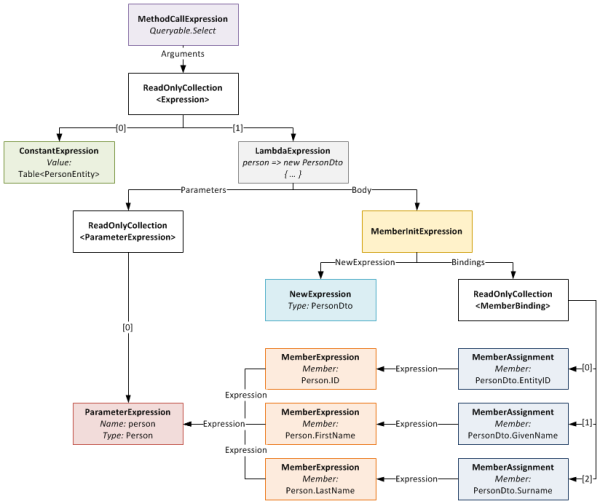 The ExpressionTreeRewriter uses the attribute to create an object implementing IExpressionRewriter which it uses to rewrite the MethodCallExpression it found. 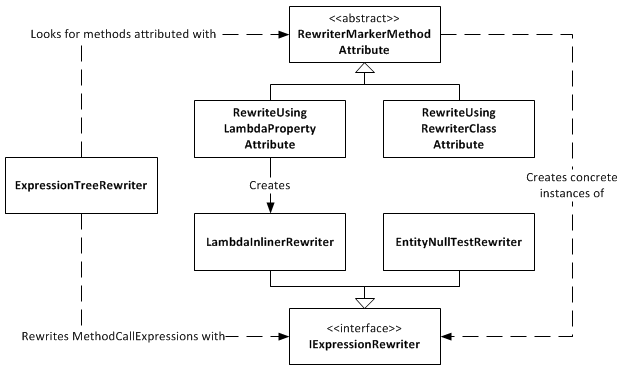 The RewriteUsingLambdaPropertyAttribute creates a LambdaInlinerRewriter properly configured to inline the LambdaExpression returned from your static property. The LambdaInlinerRewriter is called by the ExpressionTreeRewriter to rewrite the marker MethodCallExpression and replace it with the body of the LambdaExpression returned by your static property. The other marker attribute, RewriteUsingRewriterClassAttribute, allows you to specify a class that implements IExpressionRewriter which will be returned to the rewriter when it wants to rewrite that marker method. Using this attribute gives you low level control over the rewriting as you can create classes that write expression trees by hand. The advantage of EntityNullTest is that people can look at its documentation to see why it’s being used. A person new to the project, or who doesn’t know about the performance hacks, may refactor the int? cast away as it looks like pointless bad code. Using something like EntityNullTest prevents this from happening and also raises awareness of the performance issues. Enough chatter, you want the code don’t you? The ExpressionTreeRewriter is a part of the DigitallyCreated Utilities BCL library. However, at the time of writing (changeset 4d1274462543), the current release of DigitallyCreated Utilities doesn’t include it, so you’ll need to check out the code from the repository and compile it yourself (easy). The ExpressionTreeRewriter only supports .NET 4, as it uses the ExpressionVisitor class only available in .NET 4; so don’t accidentally use a revision from the .NET 3.5 branch and wonder why the rewriter is not there. I will get around to making a proper official release of DigitallyCreated Utilities at some point; I’m slowly but surely writing the doco for all the new stuff that I’ve added, and also writing a proper build script that will automate the releases for me and hopefully create NuGet packages too. The ExpressionTreeRewriter is not something you should just use willy-nilly. If you can get by without it by using constructors and method calls in your LINQ, please do so; your code will be much neater and more understandable. However, if you find yourself in a place like those of us fighting with LINQ to SQL and SQL CE 3.5 performance, a place where you really need to inline lambdas and rewrite your expression trees, please be my guest, download the code, and enjoy. Recently I’ve been optimising LINQ to SQL queries running against an SQL CE 3.5 database in order to stop them taking over 5 minutes to execute and bringing them down to only a few seconds. In this post I’m going to go into two of the biggest offenders I’ve seen so far in terms of killing query performance. Credit must go to my fellow Readifarian Colin Savage with whom I worked to discover and find solutions for the offending LINQ query expressions. In this post, I’m going to be using the following demonstration LINQ to SQL classes. Note that these are just demo classes and aren’t recommended practice or even fully fleshed out. Note that Game.DeveloperID has an index against it in the database. The above query is doing a left outer join of Game against Developer, and in the case that the developer doesn’t have any games, it’s setting the Name property of the anonymous projection object to String.Empty. Seems like a pretty reasonable query, right? The problem is that the “SELECT 1 AS [test]” subquery in the SQL is causing SQL CE to do a join between two table scans, which on tables with lots of data is very very slow. Thankfully for those using real SQL Server (I tested on 2008 R2), it seems to be able to deal with this query form and generates an efficient query plan, as shown below. So, what can we do to eliminate that subquery from the SQL? Well, we’re causing that subquery by performing a null test against the entity object in the LINQ expression (LINQ to SQL looks at the [test] column to see if there is a joined entity there; if it’s 1, there is, if it’s NULL, there isn’t). So how about this query instead? The subquery has been removed from the SQL and the query plan reflects this; it now uses an index seek instead of a second table scan in order to do the join. This is much faster! Okay, that seems like a simple fix. So when we use it like below, putting g.Name into another object, it should keep working correctly, right? It’s probably a fair to make the assumption that LINQ to SQL is using the [value] column internally to evaluate the “g.ID != 0” part of the LINQ query, but you’ll notice that in the data the value is NULL for one of the rows. This seems to be what is causing the “can’t assign a null to a bool” error we’re getting. I think this is a bug in LINQ to SQL, because as far as I can tell as this is pretty unintuitive behaviour. Note that this SQL query form, that causes this problem with its CASE, WHEN, WHEN, ELSE expression, is only generated when we project the results into another object, not when we just project the results straight into the main projection object. I don’t know why this is. Note that the query now returns the expected 0 value instead of NULL in the last row. For those using LINQ to SQL against real SQL Server, these LINQ contortions are unnecessary to get your performance as real SQL Server is able to make efficient query plans for the form of query that LINQ to SQL creates. However, SQL CE 3.5 can’t deal with these queries and so you need to munge your LINQ queries a bit to get them to perform, which is frustrating. Heading into the future, this won’t be a problem (hopefully) because SQL CE 4 doesn’t support LINQ to SQL and hopefully Entity Framework 4 doesn’t write queries like this (or maybe SQL CE 4 can just deal with it properly). For those on that software stack, it’s probably worth checking out what EF and SQL CE 4 is doing under the covers, as these problems highlight the need for software developers to watch what their LINQ providers are writing for them under the covers to make sure it’s performant. Edit: For a way to help clean up the verbose hacked up LINQ queries that you end up with when working around these performance problems, check out this post.